A simple retelling of the travels of 17th century Japanese poet, Basho, across his island homeland. The book includes examples of the haiku verses he composed. This book has amazing illustrations, and among the story are Japanese symbols and haiku verses. 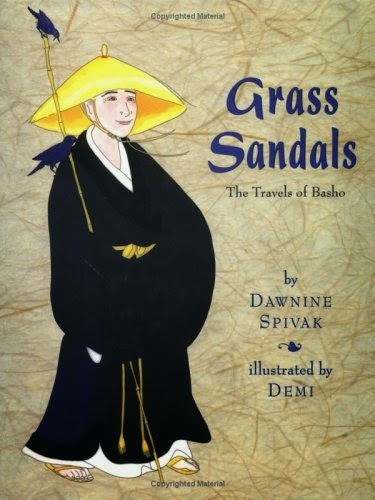 It is fun that Basho was an actual person so this book lends itself well to understanding Biographies. We looked at the country of Japan for the letter J. 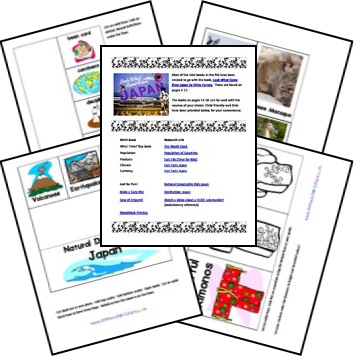 Again we utilized homeschoolshare.com for our Japan lapbook information. We checked out a couple of books from the library to help answer some of the questions in the lapbook. A study on Japan lends itself wonderfully to learning more about the culture including a traditional Japanese dinner. There are opportunities on youtube to hear the Japanese language and learn some basic greetings. Because Basho wrote Haiku poetry, this is a great opportunity to teach and have the kids try out their own Haiku. I will post ours when we have them complete. I may have to try my hand at it myself! I can't wait to check this book out. I'm always looking for Japanese tales. Haiku mixed in is just perfect for our elementary students! Thank you for this post. I can't wait to read your others!